WOW! A new What-If! And it's about something I pretend to understand! Randall posits a space elevator ("fire pole") hanging to the Earth from our Moon, and describes many things that can go wrong (even with an unobtainium "pole"). However, there's a fix for the variable-distance and the bottom-end-velocity problem. Taper it, make a compound pendulum out of it, and make the stroke velocity at the bottom match the Earth's rotation velocity at perigee touchdown latitude. The bottom descends from the sky, perhaps coils up a bit, then lifts off into the sky a few minutes later. Okay, yah, unobtainium is difficult to obtain. We cannot even make a space elevator to geosynchronous altitude (an easier task, 10 times closer and aided by centrifugal acceleration) with any known material (carbon nanotubes are superlubricious, almost perfectly slippery). But we could make a "pendulum firepole" from Phobos to Mars. Using Torayca T1100G, a commercially available superstrong carbon fiber material, which doesn't stretch/creep like polyethylene derivatives (Dyneema, Spectra, etc.). It will cost hundreds of trillions of dollars, but hey, so will a single aircraft carrier by the time we decide to deploy this. Aircraft carriers will not protect us from the Martian Threat. Phobos is in a nearly equatorial orbit, close to circular (5840 to 6120 km altitude). Phobos escape velocity is 41 km/h; I can peddle that fast on a bicycle. Entry to Mars? I could certainly slow down with good brakes, if my bike rims were big radiators for the descent heat. I presented this at the Space Elevator Conference in Seattle a few years ago. We shouldn't do this before sterile robot probes have absolutely ruled out the possibility of fossil life on Mars. if you fall off and impact, your exploding intestines will deposit enough microbes into the Martian winds to contaminate the planet, maybe 5 microbes per square meter. The information loss will be far more costly to future biotechnology development than the firepole. But then, if we lost control of it, an Earth-Moon firepole tip swinging back and forth over latitudes between 27° north and south could be a bit destructive as well. It would probably start more fires than Ray Bradbury's Farenheit 451 "firemen"; a fitting role for a "firepole". Re: What-If 0157 "Earth-Moon Fire Pole"
keithl wrote: Aircraft carriers will not protect us from the Martian Threat. I shall have my firepole lengthen and shorten so that the end is at the point in the sky that I've got no more advantage in trying to hold onto it any more. I'm no fool! Apart from the whole "having to climbing up a pole to escape the Moon, because of several bad life choices previously made" part, which will doubtless also involve the mysteriously ignored libration (if not libation). It depends how fast you're willing to go. If you're looking to stick around 100mph (the cruising speed around L1), then it's about 3 months to cover the ~210,000 miles from L1. Meanwhile, what I want to know is what happened to  and ? That last image eloquently illustrates one of the problems inherent in a 2 dimensional world. The only option for the poor surface folk is to attempt to outrun the pole or find an underground bunker instead of simply stepping to the side. He didn’t answer the question though. I imagine the ballpark of how long to get to L1 is pretty close though. I imagine if you used something more efficient than pole climbing, you could cut down significantly on the time. Think like using pedaling or rowing. Heck, I think that if you could figure out some way to use something like SRT (singe rope technique) to climb the “pole”, it’d be a hell of a lot faster than climbing by hand. It’s pretty fast and decently efficient. SuicideJunkie wrote: That last image eloquently illustrates one of the problems inherent in a 2 dimensional world. The only option for the poor surface folk is to attempt to outrun the pole or find an underground bunker instead of simply stepping to the side. They can't really outrun the pole when there's an unpassable tree ahead, can they? You could use the same pole for an Earth-to-Moon transit. The descent to the Moon would be more survivable without so many atmospheric problems. Of course the climb to L1 would take a long time, but you'd have time to shake your head sadly at the people going the other direction. Maybe even convince them to turn around and join you in your survival on the Moon. If you ever do find yourself descending a long pole/tether/rope to the Earth. I suggest you use some apparatus in addition to your spacesuit: a couple of wheels clamped around the pole, a generator, a high power tungsten-filament searchlight, and a compact "greenhouse tank" of very fast growing algae illuminated by red-spectrum light. The red-spectrum light powers algae photosynthesis with minimal waste heat; that makes the oxygen and food you need for the long trip down. I'll let you think about what closes the cycle. Yum, yum. The searchlight radiates most of the descent energy. I proposed this a few years ago the Space Elevator Conference. They hope to return the climbers to the ground for re-use, but haven't thought what to do with vast amounts of descent energy. Yet another way to transmit the descent power is to vibrate the pole like the string in a giant tin-can telephone. If the pole is that strong, it will also be very stiff, and a VERY good acoustic energy channel. You can transmit the descent energy up the pole towards the Moon to the next vehicle. I proposed this last year, along with orthorhombic carbon 8, an allotrope of carbon that is theoretically strong enough for a space elevator - but not a fire pole to the Moon. A Phobos-Mars descent is vastly easier. Mars-Phobos L1 is 2.5 kilometers "above" Stickney crater on Phobos, equivalent to a 50 centimeter high hill on Earth. If you use a 5 kW searchlight power radiator on your 500 kg vehicle, with a top speed of 100m/s, the descent takes 24 hours. Similar amounts of power could lift you from Mars back up to Phobos. With another long tether on the top side of Phobos, you could fling your vehicle into a Mars escape trajectory that returns to Earth. Getting hit by the pole would be the least of your worries. You'd also have to deal with the sonic boom as your spot on the Earth shot past the pole every ~25 hours. Assuming a traditional "round" cross-section for the pole, it's also going to get very hot. It won't be as hot as an aerobraking heat shield coming down from escape velocity, but it will still be very toasty. It's been too many years since I had to do that kind of calculation to give a better estimate. There is a strong probability that it will be hot enough to start wildfires in high-risk areas. Since we waited more than a year for this one, I'm glad it was a good one. My favorite quote: "DO NOT USE THIS GRAPH FOR PLANNING PURPOSES. It's not that it isn't accurate, it's that any plan that involves this type of data is probably a bad one." There goes my great mid-life crisis "what do I do now?" plan. It's also a problem for attendees of The Prometheus School for Running Away from Things. I believe that mechanism is used regularly by the scientists and archeologist/specimen thieves in the latter half of Seveneves. It'll have to be atop a tower sat upon the pole, as you'd have a totally straight (and totally rigid!) pole aiming off slightly below the horizontal some of the time as the Moon dips beneath the ground-level horizon, and gouging through antarctic ice-sheet or swiping through arctic ocean (and being quite fast at the point it rises back 'up' through local surface level again, whatever the topology) is going to be An Issue, one way or another. From the most extreme declination of the Moon beneath the theoretical horizon, in any astronomical program, you could probably work out the height needed to send the actual horizon 'down' enough by building high first. Maybe you can save a bit of work by sending the pole from a Earth's Pole tower-top to a matching Moon's Pole-top. Or just have a very tall tower at the Lunar Pole pole-support end so that you can always look down on the Earth Pole without any fuss? You'll also have solved the distance-to-Moon oscillation issue already with the original auto-adjusting pole-length, naturally. rmsgrey wrote: Meanwhile, what I want to know is what happened to  and ? keithl wrote: A Phobos-Mars descent is vastly easier. Mars-Phobos L1 is 2.5 kilometers "above" Stickney crater on Phobos, equivalent to a 50 centimeter high hill on Earth. If you use a 5 kW searchlight power radiator on your 500 kg vehicle, with a top speed of 100m/s, the descent takes 24 hours. Similar amounts of power could lift you from Mars back up to Phobos. With another long tether on the top side of Phobos, you could fling your vehicle into a Mars escape trajectory that returns to Earth. I'm guessing that the ground speed of Phobos is insanely high? 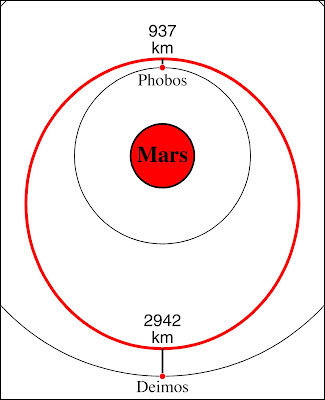 The speed of a Phobos elevator foot just above Mars' surface would be about .6 km/s. Around mach 2, the Concorde would routinely do that. This speed is about a factor of ten less than the 6 km/s of atmospheric entry from an Earth to Mars Hohmann. An interesting pair of tethers would be a ~940 km ascending from Phobos and a ~2940 km tether descending from Deimos. These two tethers share a ZRVTO -- Zero Relative Velocity Transfer Orbit. The two moons could exchange cargo and passengers with almost zero rocket propellent. HopDavid wrote: Given a safety factor of three, a Xylon Phobos tether to Mars upper atmosphere would need to mass about 640 times as much as the payload/elevator car. An interesting pair of tethers would be a ~940 km ascending from Phobos and a ~2940 km tether descending from Deimos. Sadly, Xylon, Dyneema, and other polyethylene derivatives suffer from "creep" - pull on them continuously and they just keep slowly stretching until they break. These materials are used for storm anchorages and bulletproof vests, and stressed briefly and infrequently. Look at Torayca T1100G for a $$$$ material that is very strong and does not creep. When we buy the stuff by the megatonne, perhaps we can get a price reduction. Phobos to Deimos and back is indeed interesting. Deimos for the human colony, Phobos for the robot repair shop, Mars for the sample collecting explorer robots, which are carried up and down the T1100G pendulum tether. Again, pendulum tethers can be more agile than straight tethers. Also, as soon as you send mass up and down them, they will swing anyway; angular momentum is conserved. Also, keep in mind that both Deimos and Phobos have slightly elliptical orbits, and their orbital planes differ by a couple of degrees, so the pendulum swing and release point must be modified for every trip. One trick I'm studying is accelerating packets of Deimos dust to 2 km/s while it is travelling prograde relative to Mars orbit. With very high precision aiming and timing, the packets will smack into the heat shield of a vehicle arriving from Earth, and speed it up to match orbits with Mars; specifically, with the Deimos orbit around Mars. If you spend a few days doing this, the vehicle heat shield stays relatively cool and need not ablate. So, a vehicle could rendezvous with Deimos with almost no propellant. Returning to Earth, climb to the Deimos L2 Lagrange point and "descend" (away from Mars, but towards the Sun at the proper position of Deimos's orbit) the long tether on the far side of Deimos. With the proper infrastructure in place, including launch loops on the Earth, a construction station in a highly elliptical geosynchronous (NOT geostationary) Earth orbit, and some Aldrin cyclers, the trips to and from Mars will require very little rocket thrust, and will be a pleasant and uncrowded 1 gee (centrifugal) journey. It will take many months, but that gives you plenty of time for technical journals, and learning to play tennis in Coriolis forces. keithl wrote: One trick I'm studying is accelerating packets of Deimos dust to 2 km/s while it is travelling prograde relative to Mars orbit. With very high precision aiming and timing, the packets will smack into the heat shield of a vehicle arriving from Earth, and speed it up to match orbits with Mars; specifically, with the Deimos orbit around Mars. If you spend a few days doing this, the vehicle heat shield stays relatively cool and need not ablate. So, a vehicle could rendezvous with Deimos with almost no propellant. Returning to Earth, climb to the Deimos L2 Lagrange point and "descend" (away from Mars, but towards the Sun at the proper position of Deimos's orbit) the long tether on the far side of Deimos. I was thinking of Mars interplanetary vehicles propelled by ion engines. Good chemical rockets have an exhaust velocity of around 3 to 4 km/s while ion can do 30 km/s. The Hermes rocket ship in The Martian was ion propelled. But pathetic thrust is a problem with ion engines. Which means it can take a looooooong time to climb in and out of planetary gravity wells. The back story in The Martian had Hermes depart from Low Earth Orbit (LEO) and arrive in what seems to be Low Mars Orbit (LMO)124 days later.See this trailer. Well, given Hermes' 2 mm/s^2 acceleration, it would take 40 days to spiral from LEO to earth escape. Most of that slow spiral would be spent in the Van Allen Belts. And on arrival it would take about 2 weeks to spiral from Mars escape to LMO. This completely wrecks the 124 day trajectory Andy Weir had so painstaking calculated. So it would be better to berth an ion propelled interplanetary vehicle closer to the edge of a planetary gravity well. I like to imagine berthing at EML2 while in the earth moon neighborhood. And berthing at Deimos while in the Mars neighborhood. Passengers and cargo could then travel to Phobos. And from Phobos a 1400 km tether could drop passengers and payloads into an orbit whose periapsis passes through Mars upper atmosphere. This 1400 km tether is much more plausible than a tether descending all the way to Mars' upper atmosphere. See Lower Phobos Tether. A 6135 elevator ascending from Phobos could hurl payloads to a heliocentric orbit having a 1 A.U. perihelion. In other words, hurl it towards earth. ZYLON® has superior creep resistance to p-Aramid fibers. (Creep means a non-recoverable strain after prolonged static loading.) When a certain load is applied to yarn, recoverable strain (initial strain) and non-recoverable strain are observed. For ZYLON® HM, non-recoverable strain after 100 hours under 50% of breaking load (Safety factor (SF)=2) is less than 0.03%. The safety factor I've been using in most of my scenarios is 3. Still over a periods of years and decades, creep would likely be a problem. I was thinking the same thing. It sounded very familiar. keithl wrote: Phobos escape velocity is 41 km/h; I can peddle that fast on a bicycle. verb (used with object), ped·dled, ped·dling. to carry (small articles, goods, wares, etc.) from place to place for sale at retail; hawk. to deal out, distribute, or dispense, especially in small quantities. verb (used without object), ped·aled, ped·al·ing or (especially British) ped·alled, ped·al·ling. to work or use the pedals, as in playing an organ or propelling a bicycle. verb (used with object), ped·aled, ped·al·ing or (especially British) ped·alled, ped·al·ling. to work the pedals of (an organ, bicycle, etc.). Now I'm imagining someone on a rock offering maps, umbrellas, beach shoes, cigarettes and souvenir badges to the crews of space ships as they go past. keithl wrote: One trick I'm studying is accelerating packets of Deimos dust to 2 km/s while it is travelling prograde relative to Mars orbit. With very high precision aiming and timing, the packets will smack into the heat shield of a vehicle arriving from Earth, and speed it up to match orbits with Mars; specifically, with the Deimos orbit around Mars. If you spend a few days doing this, the vehicle heat shield stays relatively cool and need not ablate. So, a vehicle could rendezvous with Deimos with almost no propellant. How are you doing the particle acceleration? Can the craft perhaps use a magnetic sail to catch the particles instead for a much larger and easier target? What if the tether didn't break when we connected it to the ground? How much of the Earth and Moon would have to be magically anchored to the tether so it won't rip out? The Earth's rotation would be slowed, and the Moon's sped up until they matched, but would the tether wrap around the planet and slam the moon into the surface first? Well, granite's shear strength is listed as 15000 ftlbf/in2, or 103421359 N/m2 for the scientists. There are a couple of spots on the Equator in Africa where the lithosphere is around 50 km thick. You've got to be able to hug this fire pole. A 40 cm diameter may be pushing it. How the anchorage would fail is open to speculation, but as a rough call, how about it pivoting at its base and slicing through the plate? To tilt 1° (873 metre track of utter devastation at the surface) it'd go through 21.8 km2 of arc. To break all of that at once (loud?) would require 2 * 21.8 * 1000000 * 103421359 = 4509 TN of force. The Moon's mass is 7.34767309 × 1022 so that's enough force to accelerate it at 6.137*10-8 m/s2. 44084481368568373610584408 seconds to get it up to speed. Without knowing how elastic and how flexible this tether is, it's hard to answer whether the Moon would swing down and bonk the surface or what. With a rigid rod tether, you're suggesting the equivalent of swinging an ice axe at a car when it passes you too close and at silly speed. Something's getting wrecked. Here's another thought: Really fast construction, insane amounts of adamantium and vibranium, some really hasty compulsory purchase orders and ... space suits or amazing cranes ... and could the Moon in Majora's Mask be caught with a giant baseball glove on an Eiffel Tower? Can't be answered without knowing how the heck the naughty boy with the mask is pulling the Moon down from all the way out and keeping it geostationary, of course. Standing on four legs ... Wait. Triforce. Three legs? I'd like some redundancy in the legs. Seven's a magic number. Seven legs. 2.61 * 1021 N per leg. 2.53 * 1014 m2 of granite shear strength per leg. Even on 50 km of crust, that's 161 km diameter feet. That's some Eiffel tower. While it might be considered less than sporting to point out how a what-if could be made more practical, you could have better results by just doing away with the pole entirely once you reach Earth's atmosphere. While you'd still be moving at about 450 m/sec relative to the Earth's surface, once you enter the atmosphere, hanging onto the pole causes more trouble than it's worth. If you stop hanging onto the pole, all you'd need would be some sort of atmospheric entry capsule, and since the speed of the pole is much less than orbital velocity, you might not even need a heat shield, just a big sort of balloony-parachutey thing to keep you from tumbling and ease the transition as your velocity adjusts in the atmosphere to match the surface of the Earth. Since you've already conceded letting the pole off the surface of the Earth, what's another hundred miles or so? There also seems to be an error in the twelfth drawing. It depicts the Earth's surface moving at 1000 meters/second, but he probably meant 1000 miles/hour. Now the pole will accidentally burn up in the Martian atmosphere. Just a thought but what if, instead of a straight pole, as you approached the Earth's atmosphere it curved to propel you in the direction of the Earth's rotation so by the time the atmosphere was significant you were already significantly slowed down relative to the ground? egc52556 wrote: You could use the same pole for an Earth-to-Moon transit. The descent to the Moon would be more survivable without so many atmospheric problems. The atmosphere helps you slow down on arrival though, whereas to land on the Moon you'll need to either start slowing down a lot sooner or a lot faster not to crash-land. Although, the lack of supersonic winds blasting your face off might very well be worth the slight addition to the travel time. Hey guys, sorry if this has already been mentioned. I almost never come to these forums, I just keep up with the main site. Don't know what they're actually called, but y'all know the superscript notes likes this? This what-if is missing numbers  and . Is this the best place to point this out for Randall to maybe see and correct it, or is there someplace better where he'd be more likely to notice? Soupspoon wrote: It'll have to be atop a tower sat upon the pole, as you'd have a totally straight (and totally rigid!) pole aiming off slightly below the horizontal some of the time as the Moon dips beneath the ground-level horizon, and gouging through antarctic ice-sheet or swiping through arctic ocean (and being quite fast at the point it rises back 'up' through local surface level again, whatever the topology) is going to be An Issue, one way or another. I did the polar tower thing in Kerbal Space Program, but with communication links instead of metal poles. 1/10th scale planets/moons, but I would have needed a 350m tall tower at the pole in order to reach a relay at the same pole of mün (itself in a circular, equatorial orbit). I settled for building four 50m tall towers in a square around the pole to simplify the engineering. A pole-encircling railway holding the base of the firepole might work out. If you have parallel tracks, you could have another train rendezvous and transfer passengers before stopping at the next station to let people on and off.